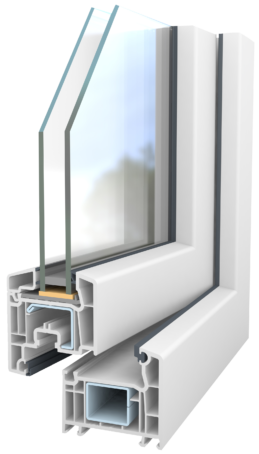 EFFECTLINE it’s a PVC joinery system with 5 insulation chambers and a profile depth of 70 mm. Its offers classic design and medium quality at an affordable price. Duplex Glass – represents 2 combined sheets of glass, glued together, ensuring high intrusion protection. The existing duplex types are Duplex 3.3.1, which contains two glass sheets of 3 mm glued together, and if the duplex is made up of two sheets of at least 4 mm, we can consider this type as an anti-burglary glass. If we also want thermal protection from this type of glass, then one of the two glass sheets should be Low-E, resulting in Duplex 3.3.1-Low-E, Duplex 4.4.1 Low-E etc.